The French for promise is the irregular -RE verb promettre. To remember this, imagine they promise to use PRO MET-eorological forecasters in the future! promettre can also mean: to show promise. - la promesse (nf) : promise. - manquer à sa promesse : to break one's promise. - comme promis : as promised. It's a promise - learn French quickly and effectively with Cartoon Memory Triggers. To remember a word, think of the pic! 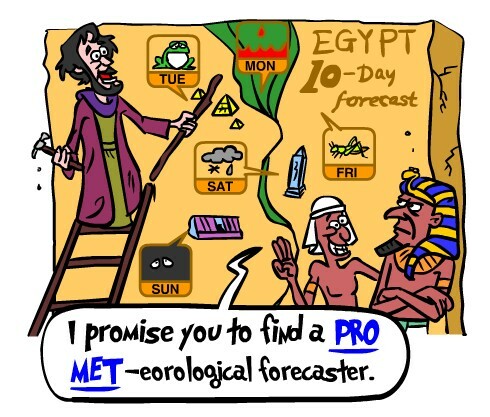 Imagine they promise to use PRO METeorological forecasters in the future! promise! promets ! promettons ! promettez ! ✔ promettre is an irregular RE verb. ✔ Learn promettre and it will reinforce the pattern for ALL those other irregular RE verbs. ✔ You can more easily remember words and verbs like the French verb promettre - French for promise - using the techniques of the world's Memory Masters. 200 Words a Day! Free Daily French Lesson Online - the French for promise is French verb promettre - fully conjugated. French Learning Made Fun and Fast with your free Daily French Verb Lesson - promettre.